Molecular analysis showed a significant intrinsic up-regulation of CNTF at 10 and 25 days after induction of the acute ocular hypertension (p = 0.0067). Molecular tissue analysis of GDNF and its receptors (GDNFR1, GDNFR2), and BDNF and its receptor (trkB) showed no change in expression. Animals that received CNTF microspheres had no significant functional recovery compared to animals which received blank microspheres (p > 0.05). Animals that received GDNF or BDNF microspheres showed significant PLR recovery (p < 0.05 and p < 0.001 respectively) compared to non-treated animals. 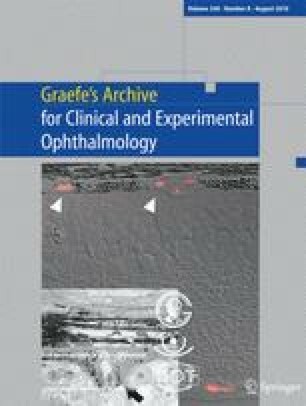 Continuous release of neurotrophic growth factors (NGFs) significantly protects optic nerve function in the experimental model of retinal ischemia observed by PLR analysis. Sinisa D. Grozdanic and Donald S. Sakaguchi equally contributed to this manuscript. We would like to thank Dr Sally Hildreth and Mr Jeff Orasky for the help with experiment performance. This work was supported in part by Department of Veterans Affairs, Veterans Health Administration, Rehabilitation Research and Development Service Grant C3919R, The Glaucoma Foundation, NY, an unrestricted grant from Research to Prevent Blindness (Dept. of Ophthalmology, University of Iowa), NIH NS044007, NIH EY019485, NIH EY019294 and ISU Biotechnology Carver Trust Grant.